Soviet postcolonial studies is an emerging field of critical inquiry, with its locus of interest in colonial aspects of the Soviet experience in the USSR and beyond. 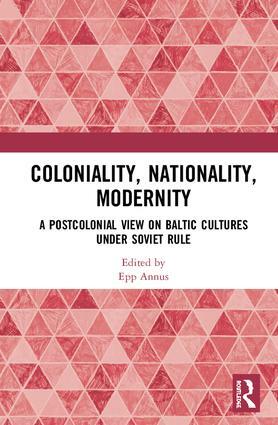 The articles in this collection offer a postcolonial perspective on Baltic societies and cultures – that is, a perspective sensitive to the effects of Soviet colonialism. The colonial situation is typically sustained by the help of colonial discourses which carry the pathos of progress and civilization. In Soviet colonial discourse, the pathos of progress is presented in terms of communist value systems, which developed certain principles of the European Enlightenment and rearticulated them through Soviet ideology. This collection explores the establishment of Soviet colonial power structures, but also strategic continuities between Soviet and Tsarist rule and the legacy of Soviet colonialism in post-Soviet Baltics. Soviet norms and rules, imposed upon the Baltic borderlands, produced new forms of transculturation, gave birth to new cultural ‘authenticities,’ and developed complex entanglements of colonial, modern and national impulses. Analyses of colonial patterns in Soviet and post-Soviet Baltic societies helps bring us closer to understanding the Soviet legacy in the former Soviet borderlands and in present-day Russia. The chapters were originally published in a special issue of the Journal of Baltic Studies. Epp Annus is a lecturer at Ohio State University and a senior researcher with the Estonian Literature Museum. She is the author of Soviet Postcolonial Studies: A View from the Western Borderlands (Routledge, 2018).